Do you think it wants to be friends? 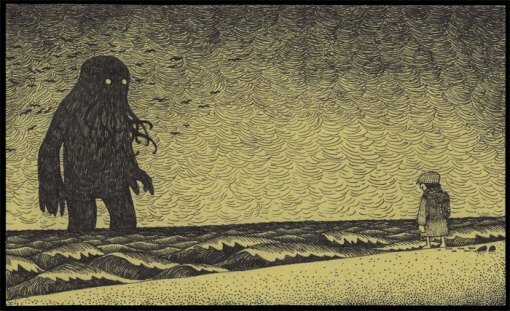 The above is created by artist John Kenn Mortensen, who has perfectly captured Gorey’s gift of odd and unsettling illustrations. You can see more of his Lovecraftian illustrations at Lovecraft eZine, or on his website. Love Gorey’s stuff and this is certainly very fun like that! Fun find! I used to have a coffee cup with some of the Mystery! artwork on it. Long gone now, though.